"Its one thing to plan a party but the kind of crowd u have or that appears in the pics also matter.lol"
That was a tweet by Judith Heard a few days back. Now we all know the last party to be held was the launch of the Zari Jewels and looking at the fight they had in March, Judith Heard was not supposed to grace this launch. 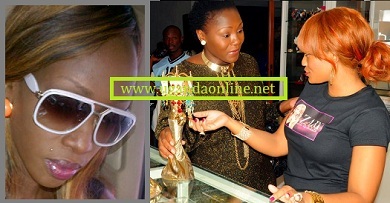 Sylvia Owori who happens to be Judith Heard's former boss was among those who turned up for the launch of Zari Jewels. These three are now business rivals bearing in mind that Judith Heard has JHFYS fashion line at Forest Mall which she could have put on Garden City but because of the Sylvia Owori Store that is based at Garden city, she decided to put it elsewhere. Now having scanned our social environment, we concluded that the above remarks were aimed at Zari who organised the party and Sylvia as the two have been having issues. Judith Heard was a model with Sylvia Owori but according to her, she was not being paid enough money until Mr. Right came her way and since then, she is now a competitor of her former boss.